Val's Quilting Studio : It's FOOTBALL Season! Aughhhhh....we all love those ultimate quilting moments. You know the ones when someone just reallllly loves the quilt you made them. They cherish is. They USE IT. They love it. "Mom it's football time and I want it to watch football with dad!" Yep...one of those ultimate moments we love! What a smart little guy! The football quilt is a no brainer. I am glad they will be an hour closer--it will make a difference! He knows how to keep GM happy! That's a great quilt, Val. Really special. Ah, great reasoning. Happy for you to have them an hour closer. How very sweet...smart boy! This is such a fun quilt, Val. We are so excited to be an hour closer as that hour makes all the difference. 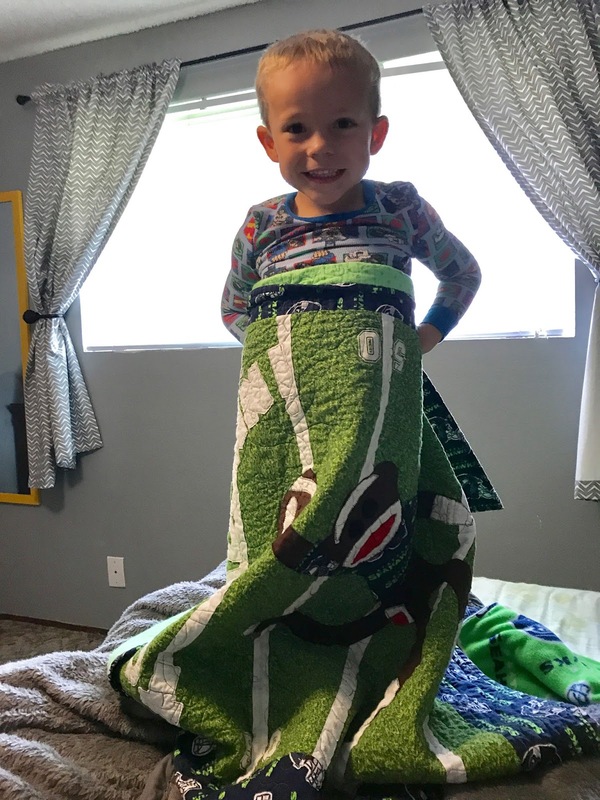 He is currently snug tight in his Seahawks Quilt and he used it this evening while watching the Seahawks play! Isn't that so cute. He treasures your quilt. What a special moment. I havent read everyone's blog for a while and it is catch up time. It goes to show you can't make the little one love something, they do it on their own..
Too precious!!! I love it when they love my quilts too. This was meant for him. So cute!! And he made a great choice on his quilt. Yipppeee, football season is here! That is the cutest young fellow ever. He looks like a sweetie. The quilt is well hidden by him. He is a doll and such a cute quilt. Glad to hear they are moving closer. This makes for so much more fun. What a sweetie! I hope the move went well for your family. It will be nice having them a bit closer. Yep, my heart just melted too! Sigh. That is so precious. Don't you just love it when the loves of our lives love our quilts? What a cutie! It's the best feeling when they love their quilts. The Football Sock Monkey is such a cute one.